Holiday or vacation travel is one of the most prominent segments of the tourism sector in the United Kingdom. UK holidaymakers take around 40 million trips abroad a year, more than for any other travel purpose. In 2015 the number of overnight stays totaled 393 million nights, generating a total expenditure of over 26 million British pounds. A rise in ‘staycations’ has created more opportunities for the domestic market in the UK. According to ABTA’s Holiday Habits report, Brits took an average of two domestic holidays a year in 2016, higher than the number of holidays taken abroad. Average spending per domestic holiday trip was recorded at 253 British pounds in 2015, with activities centred around relaxing and sightseeing or walking. 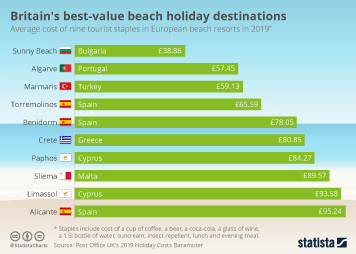 The main reasons for going on holiday, according to UK respondents to a survey conducted by the European Commission, are for the sun or beach and visiting friends and family. However other research suggests that in 2016 city breaks were more popular than beach holidays, with 53 percent and 38 percent of respondents taking such holidays respectively. The most popular overseas holiday destinations include Spain, France, Italy and the United States. Of UK residents booking holidays in 2015, around half said they chose to purchase tourism services separately, while around 40 percent chose a type of package deal. Booking via holiday booking websites such as Expedia and booking.com were almost equally as popular as travel agents in 2016, as was booking directly with the service provider. Online travel bookings have become increasingly popular and are expected to continue growing up to 2020. However when it comes to deciding where to travel, the European Commission's study shows that recommendations from personal acquaintances still hold a stronger influence than reviews and comments online.